Just recently, Kenya’s President, Uhuru Kenyatta was appointed as UNICEF’s global champion for youth empowerment; a noble position that did not augur well with Kenyans who went on to rant on social media under #shamefulUNICEF and angrily disparaged the appointment. Uhuru Kenyatta by any standards is not an old president either by age, design or even mannerisms and compared to African presidents he might be considered a teenager among his peers. Sadly it is Africanism politics that makes him a cut off the old block. He has in the recent past appointed mainly stooges who have by far passed “retirement age,” to key positions much to the chagrin of middle aged persons and the youth. Francis Muthaura 72, Matu Wamae 79, Beth Mugo 79, Marsden Madoka 75, Chris Obure 75, Ramadhan Kajembe 74 to name but a few. Kenya’s next door neighbor has one of the traditional African strongmen at the helm, His Excellency Yoweri Museveni who has also in the recent past pushed for a Ugandan constitution amendment to scrap an age limit of 75 years for presidential candidates to enable him vie. Museveni has been president since 1986 and is one the World’s longest serving president who by the grand scheme of politics only death will do him part from the presidency. His former Doctor turned political nemesis Kizza Besigye has been worn down by years of torture under Museveni’s henchmen and is an almost but done opponent. Probably knowing his former physician too well, Museveni has continuously crashed his ambitions with brute force at some point nearly blinding him. Like other African strongmen of yesteryears, Museveni has been drunk with power so much, enjoying absolute power and running his Country like a harem until a young man stood up to challenge the status quo. Driven by his past popularity and a strong youth surge, Robert Kyagulanyim a.k.a Bobi Wine; musician turned politician who enjoys massive support particularly from the youth, has risen up and challenged the absolute authority. 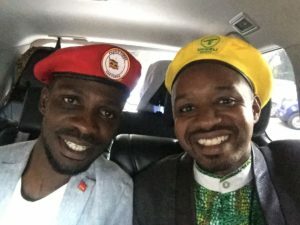 Though the consequences have followed the more traditional route of violence and torture, Bobi Wine’s popularity is urging him on and unlike his opposition predecessors who had at some point been sleeping with Museveni or were in positions enjoying trappings of power, his music popularity and ghetto background are the roots he clings on thus his massive appeal of never having been part of the oppression. He just recently flew back from the U.S where he had gone to seek medical treatment after being bludgeoned by Museveni’s henchmen. During his detention, massive demonstrations and appeals for his release were organized even in Kenya as activists even crossed over to Uganda to picket for his release. Sadly another youthful African politician continues to be prosecuted just because she challenged the sitting president in an election in Rwanda. Diane Shima Rwigara together with her Mother and Sister were charged with forgery and offenses against State Security offenses that attract at least 20 years imprisonment. It is an open secret that her main crime was her attempt to vie against Paul Kagame in 2017. Rwigara is daughter to prominent businessman, Assinapol Rwigara who died under mysterious circumstances in 2015 when a truck rammed his car. The late Rwigara initially funded the Rwandan Patriotic Front but later on his relationship and Kagame’s soured and his death raised many suspicions. Diane while kick starting her campaign insisted on finding justice for her father and this was the last nail that sealed her coffin. Kagame came to Power in 1994 and just like Museveni, he recently changed the constitution to enable him vie for more than two terms and like his Ugandan counterpart it seems only death will remove him from power. In August, Kenyans went on a rampage on Twitter under #FreeDianeRwigara to pressure Kagame to release the 36 year old Diane. First, slowly some young people from different sectors are rising up to challenge powerful, absolute and total Presidents without fear. Secondly, there is a union forming online especially among the youth to encourage those who are being prosecuted and agitation for observance of human rights and tolerance from the powers that are. Thirdly, Young Kenyans perform dismally when it comes to making decisions during elections but they get top honors when it comes to online campaigns but they must realize that real, deep and true changes are made in elections or when people hit the streets, remember the Arab spring.